Objectives In a genome-wide association study, we discovered chromosome 12q15 (defined as rs73329476) as a silica-related pneumoconiosis susceptibility region. However, the causal variants in this region have not yet been reported. Methods We systematically screened eight potentially functional single-neucleotide polymorphism (SNPs) in the genes near rs73329476 (carboxypeptidase M (CPM) and cleavage and polyadenylation specific factor 6 (CPSF6)) in a case–control study including 177 cases with silicosis and 204 healthy controls, matched to cases with years of silica dust exposure. We evaluated the associations between these eight SNPs and the development of silicosis. Luciferase reporter gene assays were performed to test the effects of selected SNP on the activity of CPM in the promoter. In addition, a two-stage case–control study was performed to investigate the expression differences of the two genes in peripheral blood leucocytes from a total of 64 cases with silicosis and 64 healthy controls with similar years of silica dust exposure as the cases. Results We found a strong association between the mutant rs12812500 G allele and the susceptibility of silicosis (OR=1.45, 95% CI 1.03 to 2.04, p=0.034), while luciferase reporter gene assays indicated that the mutant G allele of rs12812500 is strongly associated with increased luciferase levels compared with the wild-type C allele (p<0.01). Moreover, the mRNA (peripheral blood leucocytes) expression of the CPM gene was significantly higher in subjects with silicosis compared with healthy controls. Conclusions The rs12812500 variant of the CPM gene may increase silicosis susceptibility by affecting the expression of CPM, which may contribute to silicosis susceptibility with biological plausibility. We discovered chromosome 12q15 (defined as rs73329476) as a silica-related pneumoconiosis susceptibility region in a previous genome-wide association study. However, the causal variants in this region have not yet been reported. A novel potentially functional variant rs12812500 of the carboxypeptidase M (CPM) gene in 12q15 may increase silicosis susceptibility, while the expression level of the CPM gene was significantly higher in subjects with silicosis compared with healthy controls. Our findings may shed a light on the aetiology and underlying biological mechanisms of silicosis and might have crucial relevance to the identification of high-risk individuals with occupational silica dust exposure for intervention. According to the annual National Report of Occupational Diseases in China, the number of newly reported occupational diseases in 2016 has exceeded 30 000 for the first time, an increase of 122% compared with the number in 2007. 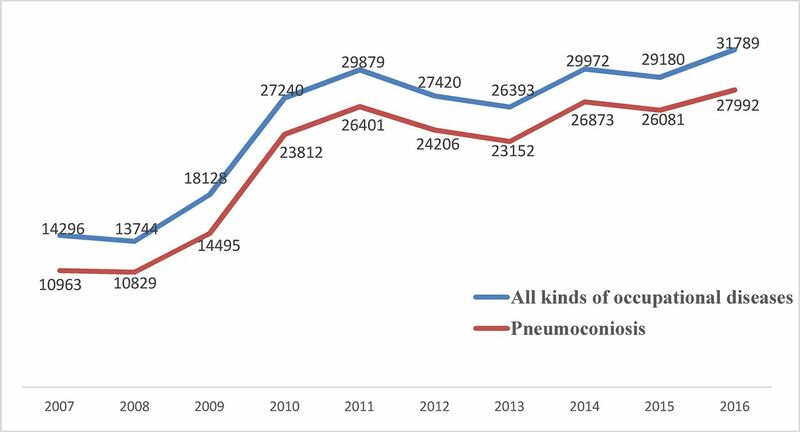 The number of newly reported patients with pneumoconiosis was 27 992 in 2016, which is approximately 2.5 times than the reported cases (10 963) in 2007 (National Health Commission of the People’s Republic of China website. http://www.nhfpc.gov.cn/) (figure 1). Silicosis is one of the most common types of pneumoconiosis and that disease has negative impacts on people’s physical and mental well-being,1 2 and has long been major public health and social issue in China. The number of annually reported all kinds of occupational diseases and pneumoconiosis from 2007 to 2016. Genome-wide association studies (GWASs) have been employed to discover the genetic architecture of a multitude of diseases and traits with complex causes in the recent decades.10–12 In relation to this study, a genome-wide significant (p<5.0×10−8) association of silica-related pneumoconiosis with marker SNP rs73329476 at 12q15 has been identified by a three-stage GWAS in the Chinese Han population.13 However, just like most of the other reported SNPs identified by GWASs that are located in genetic deserts and lack biological function, the rs73329476 is no exception. The regional plot shows that the rs73329476 signal is intergenic, located 177 kb upstream of carboxypeptidase M (CPM) and 129 kb upstream of cleavage and polyadenylation-specific factor 6 (CPSF6) (figure 2), and the underlying causal mechanism in this region is not fully understood. It is likely that the GWAS signal originates from one or many as yet unidentified causal variants. Schematic of study design. CPM, carboxypeptidase M; CPSF6, cleavage and polyadenylation specific factor 6; SNP, single-neucleotide polymorphism. 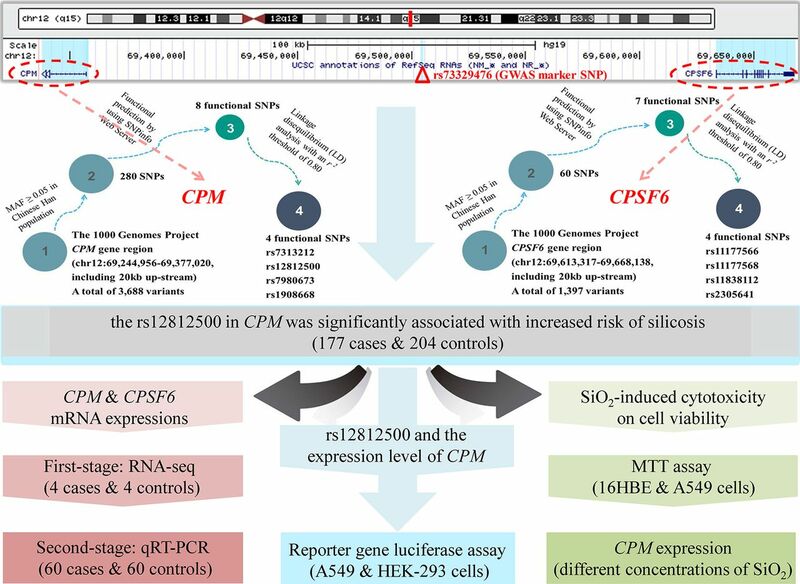 In this study, in order to determine the potentially causal variants in the genes (CPM and CPSF6) near GWAS identified marker (rs73329476) that might affect the susceptibility to silicosis, we systematically screened and evaluated eight functional SNPs in CPM and CPSF6 gene regions predicated by the SNPinfo database. Associations with silicosis of those selected functional SNPs were evaluated in a case–control study including 177 silicosis cases and 204 silicosis-free healthy controls matched years of exposure to silica dust to that of the cases. In addition, we performed a two-stage case–control study to investigate the expression profiles of the two genes (CPM and CPSF6) in peripheral blood leucocytes from a total of 64 silicosis cases and 64 silicosis-free healthy controls with similar silica dust exposure years as the cases (first stage: 4 cases and 4 controls; second stage: 60 cases and 60 controls). A schematic diagram of the study design is displayed in figure 2. First, a case–control study matched by silica dust exposure years was designed to evaluate the associations between functional genetic variants across CPM and CPSF6 gene regions and the susceptibility of silicosis. The silicosis cases were recruited from the Occupational Disease Institute of Wuxi from 2012 to 2016. All these subjects (miners, rock blasters and workers in the crushing area of the mine and so on) were previously exposed to occupational silica dust and those exposed to asbestos were excluded. The healthy worker controls that exposed to silica dust were recruited from the same places as the cases and were matched to the cases on years of silica dust exposure. In our study, the subjects exposed to silica dust received routine health surveillance including physical examination and continuous chest X-rays every 2 years, even after cessation of silica dust exposure and the cases were diagnosed as stage I, stage II or stage III silicosis according to the size, profusion and distribution range of opacities on chest X-rays by three national certified occupational physicians based on the China National Diagnostic Criteria for Pneumoconiosis (GBZ 70-2009). The study including a total of 177 silicosis cases and 204 healthy worker controls matched on silica dust exposure years were analysed to assess associations between eight selected functional SNPs and the susceptibility of silicosis, which are entirely consistent with our previously published study.8 14 Furthermore, a two-stage case–control study matched by silica dust exposure years was designed to investigate the expression differences of the two genes (CPM and CPSF6) between silicosis cases and healthy worker controls. In the first stage, a total of 4 healthy worker controls that were exposed to silica dust were randomly selected from a pool of >100 individuals with occupational dust exposure who participated in routine health surveillance in September 2017 in Wuxi in Jiangsu Province and were frequency-matched with the 4 silicosis cases according to silica dust exposure years. In the second stage, 60 healthy worker controls were randomly selected for the 60 silicosis cases from a pool of >500 individuals from March 2018 to May 2018 in a manner similar to that in the first stage. All subjects were unrelated Han Chinese. Each study subject completed an interview with a trained investigator using a structured questionnaire to collect information regarding the demographic characteristics and environmental exposure. All subjects provided written informed consent, and the study was reviewed by the Ethics Committee of the Affiliated Hospital of Nantong University. As shown in figure 2, based on the 1000 Genomes Project and HaploReg V.4.1, common SNPs (MAF ≥0.05) in the Chinese Han population were screened in the CPM and CPSF6 gene regions (including 20 kb upstream). Then, the web-based SNPinfo database (http:// snpinfo.niehs.nih.gov/) was used to predict the potential function of these SNPs. After that, linkage disequilibrium analysis with an r2 threshold of 0.80 was applied to further filter these functional SNPs. As a result, eight SNPs with motifs predicted to be transcription factor-binding sites or splicing sites (ESE or ESS) were retained in the genotyping stage. Peripheral blood was collected from each subject only after obtaining written informed consent, and genomic DNA was extracted from the samples using a DNA extraction kit (Qiagen). Genotyping was performed using the SNaPshot (®) single-base extensionassay (probes details used for the eight genotyped SNPs are shown in the online supplementary table 1) by researchers blinded to the subjects’ case or control status. All SNPs were successfully genotyped, with call rates >99%. Total RNA isolated from the peripheral blood leucocytes from four silicosis cases and four healthy worker controls in the first stage was extracted using TRIzol (Invitrogen) and a miRNeasy Mini Kit (QIAGEN) following the manufacturer’s instructions. Then, RNA samples were sent to Gminix, Biotechnology Co, Ltd (Shanghai, China) for RNA-seq. LncRNA, mRNA and circRNA sequencing steps were performed on an Illumina HiSeq X10 sequencing platform with 15G reads (Illumina, San Diego, California, USA), while miRNA sequencing step was performed on an Illumina HiSeq 2500 sequencing platform with 10M reads (Illumina, San Diego, California, USA). To validate the CPM expression level among silicosis case group and healthy control group, 120 additional samples (60 from silicosis case and 60 from healthy controls) were collected and used for quantification, and the CPM relative expression level in each group was performed by qRT-PCR (Applied Biosystems, Foster City, California, USA), GAPDH was used as the internal control. All reactions were run in triplicate. Analysis of CPM relative expression was calculated using the equation 2−△△Ct (Ct, the threshold cycle to detect fluorescence). The human lung cancer cells (A549), human embryonic kidney cells (HEK-293) and human bronchial epithelial (16HBE) were purchased from the Shanghai Institute of Biochemistry and Cell Biology, Chinese Academy of Sciences (Shanghai, China). The cell lines were cultured in Dulbecco’s modified Eagle’s medium (DMEM) with 10% heat-inactivated fetal bovine serum (Gibco, USA) and 100 µg/mL streptomycin (Gibco, USA) at 37°C in incubator supplemented with 5% CO2. A pair of luciferases was constructed to explore whether the rs12812500 C>G transversion had an effect on the expression of CPM. The wild and variant constructs were generated by cloning the 5'-flanking region sequence of the human CPM gene; this region contained 600 bp DNA (including rs12812500) sequences, which were then separately synthesised and constructed into a pGL4.23 minimal promoter vector (Promega, Madison, Wisconsin, USA) by the General Biosystems Company (An Hui, China) and sequenced for confirmation of experimental success. For transfection, A549 and HEK-293 cells were seeded into six-well culture plates. A total of 1 µg of the constructed luciferase reporter gene plasmids were transfected via Lipofectamine-2000 transfection reagent. To correct the transfection efficiency, pRL-TK (as a normalising control) was transiently cotransfected into the cells. After 48 hours of transfection, the cells were washed with PBS and lysed with 1×passive lysis buffer. Luciferase activity was determined by the Dual-Luciferase Reporter Assay System (Promega, Madison, Wisconsin, USA) according to the manufacturer’s instructions. Each experiment was repeated three times independently. The effects of SiO2-induced cytotoxicity on the viability of 16HBE and A549 cells were evaluated by the 3-(4,5-dimethylthiazol-2-thiazolyl)−2,5-diphenyl-2-H-tetrazolium bromide (MTT) assay. A final volume of 100 µL of the test cells, which were diluted to a density of 5×104 cells/mL, was plated into 96-well plates. After 24 hours of incubation, the cells were treated with varying concentrations of silicon dioxide (0–3200 µg/mL) (15 nm, MACKLIN, Shanghai, China) for 12, 24 or 48 hours. A total of 10 µL of MTT solution was added to each well and incubated for 3 hours at 37°C. After that, the supernatant was removed, and dimethyl sulfoxide (DMSO) (Sigma, Italy) was used to dissolve the formazan crystals. The optical density (OD) value at a wavelength of 570 nm was measured with a microplate autoreader (Promega, Fitchburg, Wisconsin, USA). All experiments were repeated three times, and the data are expressed as the means (±SD). Two-sided χ 2 tests and Student’s t-tests were used to evaluate distribution differences in demographic characteristics as well as in environmental exposures between the cases and controls. Logistic regression analyses with adjustment for age, gender, silica dust exposure years and smoking status were employed to evaluate associations between CPM and CPSF6 genetic variants and the development of silicosis and to estimate ORs and 95% CIs. All statistical analyses were performed using Stata V.12.0 software. The characteristics of the 177 silicosis cases and 204 healthy controls with similar silica dust exposure years as the cases included in this study are entirely consistent with those in our previously published study8 14 (online supplementary table 2). As presented in table 1, the variant G allele of rs12812500 in CPM was strongly associated with an increased risk of silicosis (OR=1.45, 95% CI 1.03 to 2.04, p=0.034) in an additive genetic model after controlling for age, gender, silica dust exposure years and smoking status. However, no obvious associations were observed among the remaining seven SNPs and silicosis. Considering that rs12812500 is located 210 bp upstream of CPM, according to the web-based SNP analysis tool HaploReg V.4.1 (http://archive.broadinstitute.org/mammals/haploreg/haploreg.php), rs12812500 is located on the promoter of CPM and might result in aberrant transcription of CPM. Therefore, we further investigated whether the rs12812500 C>G polymorphism might alter the expression level of CPM. To that end, two luciferase reporter gene plasmids (rs12812500 C and G alleles) were constructed. The above vectors were transfected into A549 and HEK-293 cells. 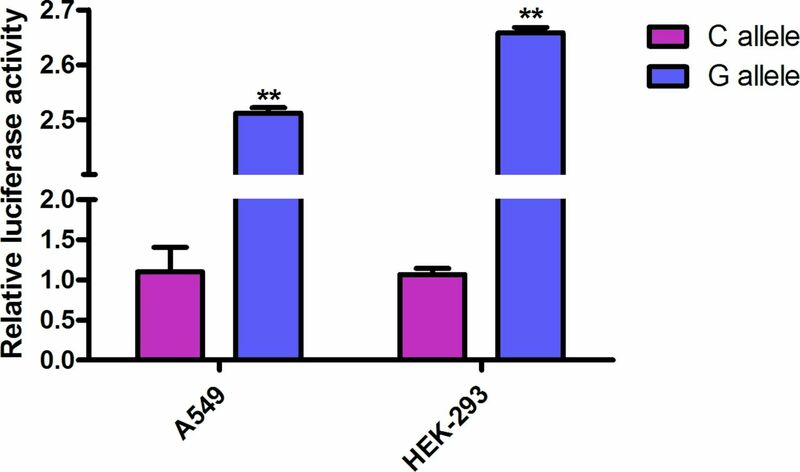 As shown in figure 3, the reporter gene vectors with the mutant rs12812500 G allele significantly increased the relative luciferase activities compared with the wild-type rs12812500 C allele in both the A549 and HEK-293 cell lines (p<0.01). Luciferase activity of two constructs in different cell lines. **P<0.01 compared with construct counterpart. The global gene expression in peripheral blood leucocytes among four cases with silicosis and four healthy controls with similar silica dust exposure years as the silicosis cases was evaluated using RNA-seq. The expression of CPM was upregulated in silicosis cases compared with the healthy controls (p=0.041) (figure 4A), while there was no significant difference for CPSF6 (p=0.741). Therefore, to validate whether the CPM expression level was higher in the silicosis group than in the control group, we further tested CPM mRNA expression levels in total cellular RNA from the peripheral blood leucocytes of 120 individual samples (60 silicosis cases and 60 healthy controls) using qRT-PCR and observed that the relative expression of CPM was still significantly higher in subjects with silicosis compared with healthy controls (p=1.08×10−6) (figure 4B). CPM had significantly higher expression levels in silicosis cases than in controls. (A) The relative expression levels of CPM in RNA-seq samples. (B) The relative expression levels of CPM in qRT-PCR validation samples. qRT-PCR, quantitative real-time polymerase chain reaction. We explored the effect of SiO2-induced cytotoxicity in 16HBE and A549 cells using the MTT assay. As shown in the online supplementary figure 1, in both cases, the clear observation was that SiO2 significantly reduced cell viability in a time-dependent and dose-dependent manner. Furthermore, we also observed that the expression of CPM increased in both 16HBE and A549 cells as the concentration of SiO2 increased (p<0.05) (online supplementary figure 2). To the best of our knowledge, no study has systematically investigated SNPs in the CPM and CPSF6 gene regions for their association with the susceptibility of silicosis. In the present study, we first systematically explored the association between eight potentially functional SNPs in the CPM and CPSF6 gene regions and silicosis in a Chinese Han population, and we found that the mutant G allele of rs12812500 was associated with an increased odds of silicosis. Further luciferase reporter assays identified that the mutant G allele of rs12812500 is associated with increased luciferase levels compared with the wild-type C allele. Then, we explored the differences in expression of CPM and CPSF6 in peripheral blood leucocytes by using a two-stage case–control study and found that the relative expression of CPM was significantly higher in subjects with silicosis compared with healthy controls. Moreover, we observed a significant increase in CPM expression in both 16HBE and A549 cells as the concentration of SiO2 increased. CPM is a member of the family of carboxypeptidases, and the presence of CPM is frequently on the boundary of being controlled by the environment or by the host; therefore, CPM has been suggested to play critical roles in inflammatory diseases for decades.15 CPM mainly functions by cleaving the carboxy terminal arginine from either bradykinin (BK) or kallidin (KD), the main kinins, leading to the generation of the active metabolites des-Arg-BK (DABK) and des-Arg-KD (DAKD). Once DABK or DAKD are efficiently delivered to the kinin B1 receptor (BKB1R), BKB1R signalling is markedly enhanced. In addition, by binding to the extracellular loop 2 of BKB1R, CPM may also give rise to a conformational activation of BKB1R signalling.16 17 Moreover, BKB1R is highly inducible by inflammatory mediators, while genetic and pharmacological inhibition of BKB1R may attenuate the inflammatory response and fibrosis in some organs (eg, lung, kidney and heart).18–21 Thus, it is plausible that a higher expression level of CPM may promote the progression of lung fibrosis due to chronic inflammation by activating BKB1R signalling. The SNP rs12812500 is located 0.21 kb upstream of CPM, and according to the SNPinfo database, the motif is predicted to be bound by one or several transcription factors. Furthermore, luciferase reporter gene assays revealed that the rs12812500 C>G transversion could increase the expression level of CPM. Thus, we further evaluated the potential biological functions of rs12812500 using bioinformatics analysis based on the ENCODE DNase-seq database (http://genome.ucsc.edu/) and the JASPAR database (http://jaspar.genereg.net/). The SNP rs12812500 is within the DNase I hypersensitivity clusters associated with gene regulatory elements and is modified by histone H3K4Me1, which is often found near regulatory elements. The JASPAR database for predicting transcription factor binding revealed that the relative score of ETV2-binding ability is higher in the sequence with the mutant G allele than in the wild-type C allele (online supplementary figure 3). Thus, it is biologically plausible that the mutant G allele of rs12812500 might increase the binding of transcription factor ETV2 to the promoter of CPM through a transcriptional mechanism, increasing CPM expression, which may ultimately be involved in the initiation of silicosis development. The present study has several advantages. First, although there was a small sample size (4 cases and 4 controls) in the first stage used for RNA-seq, there was a larger replication population (60 cases and 60 controls) of the second stage. The facts that CPM, which was chosen for follow-up investigation, was supported by strong evidence in the replication set and that the effect size was in the same direction as in the RNA-seq stage are encouraging. Second, in both the genetic association study and the additional gene expression study, our efforts to match cases and controls in each stage based on the number of years of silica dust exposure and adjustment of other potential confounding factors may reduce the impact of confounders on the observed associations. However, some limitations also need to be addressed in this study. First, we demonstrated only a difference in the expression of CPM in peripheral blood leucocytes between silicosis cases and healthy controls; however, the difficulty in obtaining lung tissues from patients with silicosis for tissue-based expression assays limited us to evaluate the expression differences in CPM between fibrotic lung tissues and normal lung tissues. Second, the functional annotation of CPM in our present study is simplified. Further and more complex mechanistic studies of the role of CPM in the process of pulmonary fibrosis may be needed to extend our findings. Third, because data of cumulative silica exposures were not available from each study subject that may restrict us to conduct analyses by quantitative estimates of cumulative silica exposure and adjust this factor in the analysis. Fourth, we did not found significant expression quantitative trait locus (eQTL) between rs12812500 and CPM in neither lung tissues (p=0.16) nor whole blood (p=0.21) from the Genotype-Tissue Expression (GTEx) database, although our luciferase reporter gene assays indicated that the mutant G allele of rs12812500 is strongly associated with increased luciferase levels compared with the wild-type C allele. Nevertheless, further eQTL analyses in lung tissues as well as whole blood are required to evaluate the relationship between rs12812500 and CPM expression levels. In conclusion, we discovered that the functional variant rs12812500 of the CPM gene may increase the susceptibility of silicosis by affecting the expression of the CPM gene. The expression of CPM in peripheral blood leucocytes is higher in silicosis cases than in healthy controls. Our results may shed a light on the aetiology of silicosis with biological plausibility. Further validation and functional studies are still warranted to confirm and illuminate the underlying biological mechanisms of the newly identified variant as well as the role of the CPM gene in silicosis development. This work was partially supported by the National Natural Science Foundation of China (81502876, 81602021, 81871115), the Natural Science Research of Jiangsu Institutions (15KJB330006), the Science and Technology Program of Nantong City (MS22015088), Jiangsu students’ innovation and entrepreneurship training program (201810304057Z), Jiangsu Provincial Key Discipline of Medicine (ZDXKA2016003), Primary Research and Development Plan of Jiangsu Province (BE2018747) and Jiangsu Overseas Visiting Scholar Program for University Prominent Young & Middle-aged Teachers and Presidents in 2017. MC, SW, WW and YY contributed equally. Contributors Study design was led by XZ, Z-FZ and JW, with contributions from WW, YY, MZ, LS, TT, YL, WY, QH and MY carried out enrolment of participants and collection of human samples. Data collection was carried out by WW, YY, MZ and LS. Statistical analyses were conducted by YG, JX and YL. MC and SW drafted the manuscript. All authors participated in data analysis, critically revised the manuscript and approved the final version. Funding The funding sources had no role to play in the study design, the collection and interpretation of the data, writing of the report or decision to submit this paper for publication. Ethics approval Ethics Committee of the Affiliated Hospital of Nantong University.